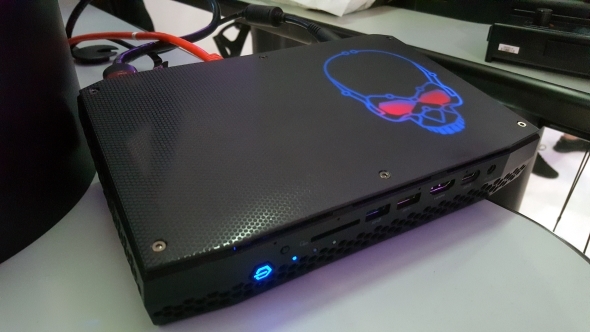 A pre-production engineering sample of Intel’s eighth generation Hades Canyon NUC Mini PC (Next Unit of Computing) has made it into the hands of Korean hardware site, Playwares. This Vega-powered mini PC seems to be capable of some pretty incredible 1080p performance despite its tiny size, and is expected to launch sometime later this month – potentially at GDC. Can’t decide whether to go Intel or AMD for your next build? Here are the best CPUs for gaming around. This miniscule VR-ready PC runs at a TDP of 100W and is powered by Intel’s Kaby Lake G i7 8809G, a four-core, eight-thread processor running at 3.1 base clock and 4.2 boost clock with 24CUs of AMD’s Vega M GPU. Unlike AMD’s recently released Raven Ridge desktop APUs which rely on the system memory, this chip comes with 4GB of the super high-bandwidth HBM2 memory on the same BGA package. The NUC itself features the usual compatibility for regular sized component’s you’d find on a full-sized PC, so these will differ from system to system. As you might expect, the engineering sample comes with some pretty powerful parts, including a Samsung 960 Pro 1TB M.2 SSD, and 16GB of 2133MHz memory. The OC scores bump the memory speed up to 2,666MHz, and the Vega GPU up to 1,300MHz, from the previous max boost of 1,190Mhz. 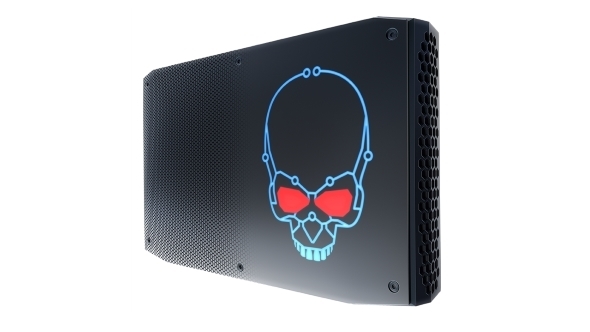 For an entire mini PC that could fit in a inside the box your graphics card came in, the Hades Canyon NUC sure packs a punch. Rise of the Tomb Raider manages an average of 53fps on the Ultra preset, and 59fps when overclocked. Rainbow Six: Siege reaches a whopping 96fps and 106fps while overclocked, even with the Ultra preset enabled. For the millions of players on Player Unknown’s Battlegrounds, the Hades Canyon NUC manages 65fps on average, and 70fps OC, while utilising a custom preset comparable “to many gamers’ realistic custom options”. In 3DMark Firestrike, the NUC manages a score of 10,147. For comparison, the Asus GL702ZC, powered by a Ryzen 1700 and RX 480 4GB, scored 10,063 in our benchmarking for the same run. We gave the Hades Canyon NUC a test drive back at CES in January, and we were pleasantly surprised as to the VR capabilities of the flagship Kaby Lake G chip. A quick game of Echo Arena was enough proof that testing out VR in front of many people is a terrible experience, but also that the Hades Canyon NUC was more than capable of living up to the VR-ready tag in this title. Interestingly, while temps were somewhat high around under load – as you might expect from such a small form-factor build – Playwares report that they noticed very limited and inconsistent thermal throttling, even when the CPU package reached fiery temperatures of 110°C. We also got some hands-on experience with the NUC itself, and don’t let it fool you. Despite that small footprint, the tech packed into that tiny chassis is considerably weighty in the way that is really satisfying… you know what I mean, right? All in all, the NUC powered by the Vega M GH graphics offers more than enough graphical grunt to get the job done at 1080p. Unfortunately, this hefty, tech-filled mini PC will likely come with a pretty hefty price tag to match, and you’ll likely have to kit it out with expensive memory and storage, too. We finally have some serious small form-factor 1080p gaming potential either close to launch or already out in the wild – with Intel’s high-range Kaby Lake G matched by the recently launched AMD Raven Ridge APUs at the low- and mid-range. 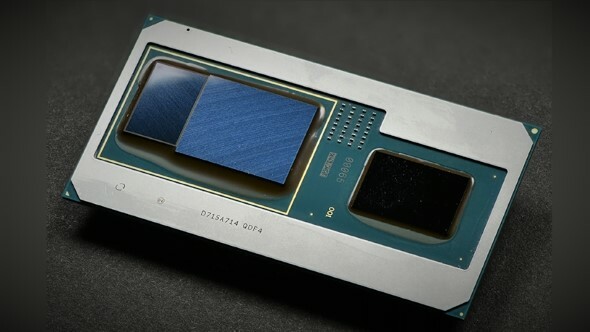 Potentially, we will see AMD’s Vega M as standalone products in the mix too, but we’re yet to hear more on this GPUs since Lisa Su spoke about them at CES in January.